Monday: Run, 1:27, 8 miles, 1,342 feet climbing. I flew out of Salt Lake City in the early afternoon, but was able to squeeze in a 90-minute trail run with my dad before I left town. We ran an out-and-back on the Bonneville Shoreline Trail in Corner Canyon, which he'd never run or hiked before. Despite spending the rest of the week in California, Monday was by far my warmest day, with temperatures near 60 degrees and a strong warm wind out of the east. Tuesday: Run, 0:54, 5.8 miles, 614 feet climbing. The standard Tuesday run — Monta Vista loop between 4 and 5 p.m. I like having one workout that's exactly the same every single week. In future weeks I might try to designate Tuesday as a rest day. I finally changed out my shoes this week, a pair of Hoka Mafate 2s that I've had for a while but were nearly new. And the pain on top of my left foot went away entirely. I suppose I was right about the theory that my Mafate 3s were worn out. Wednesday: Road bike, 2:27, 33.5 miles, 3,719 feet climbing. I was woefully underdressed for this ride with temperatures in the low 30s and a downhill windchill that must have approached 20 degrees. I know I'm California soft now, but this had all of the hallmarks of extreme cold training, with numbness slowly creeping all the way up my extremities, involuntary shivering, and a dramatic drop in core temperature that took most of the evening to recover. I forget just how exhausting this process is — the rewarming took more out of me than the ride itself. It was a useful reminder for real winter conditions, to always stop and deal with body chill before it gets out of control — it's not only dangerous, but it's also a massive energy drain. Thursday: 0:57, 6.3 miles, 942 feet climbing. For this run I met up with Chris, who is a San Jose local that I met on the flight to Salt Lake City last week. We spent the whole 2.5-hour flight talking about Bitcoin and growing up in Utah. Yes, I sat next to someone on a plane and actually made a new friend. I am not a chatty person, so this was a new experience for me. Chris is a triathlete and mainly a road runner, and I was hoping to draw him to the light side of trail running with my favorite 10K loop in Rancho while heavily talking up a 50K race in Woodside. Maybe I'll see him there on Sunday. run with, especially after we got lost and had to crawl up a super steep, cow-stomped slope. She told a few great stories during the run but then admitted she doesn't like talking about herself later that afternoon. If we ever end up doing formal interviews, they'll likely be best on the move. Saturday: Run, 6:27, 23 miles, 5,232 feet climbing. 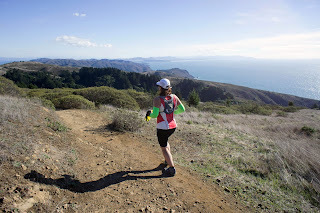 Pacing for 9 miles and then rambling on my own for another 14 in the Marin Headlands, at a mellow pace all around. But after standing around for much of the morning at the Stinson Beach aid station, it was a decent day on my feet, which I think is the best kind of physical Iditarod Training. There was even a strong, cold wind on the ridge tops to simulate Alaska just a little. Sunday: Road bike, 1:46, 17.7 miles, 2,495 feet climbing. Beat played with the Snoots and I enjoyed a leisurely climb. It was another clear, cold day, with near-freezing temperatures on top of Montebello. Beat and I both brought our windproof fleece jackets to test on the descent. I admit I had to put mine on two thirds of the way up the climb, because I was too cold. We still didn't wear adequate gloves, tights, or footgear, so we still froze on the descent, although not to the extent of Wednesday. I'm definitely California soft now, but I feel like I got some real cold-weather training in this week. I also had a chance to run with several new and interesting people, which was a fun diversion from my usual solo style. Beat is traveling to Germany this week to attend his step-father's funeral. My goal for this coming week is, of course, the 50K trail run on Sunday, and then perhaps a long ride on Monday. I want to start incorporating some back-to-back long efforts without the risk of ramping up running mileage too much. I'm also giving more thought to the whole tire-dragging thing, but I don't think I can deal with being that conspicuous on local trails. I wish there was a way to simulate sled dragging in a snowless climate without looking like an idiot. A heavy backpack on hills might work. Please help the "hard of remembering": Where in California are you now?